Looking for a healthy gluten-free dessert for the holidays? 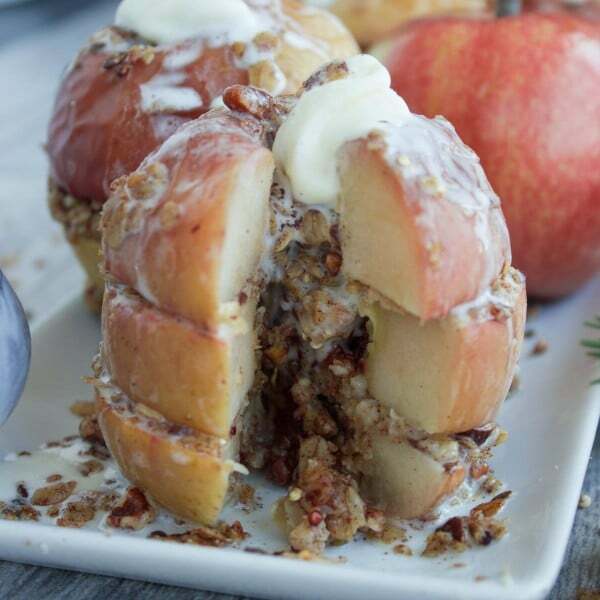 Try my Baked Apples with Granola Crunch filling! They are so easy to make and an absolute crowd pleaser! 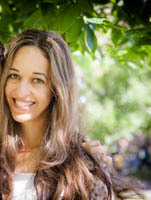 Serve them with vanilla ice cream, or dairy-free coconut ice cream for a vegan holiday dessert! 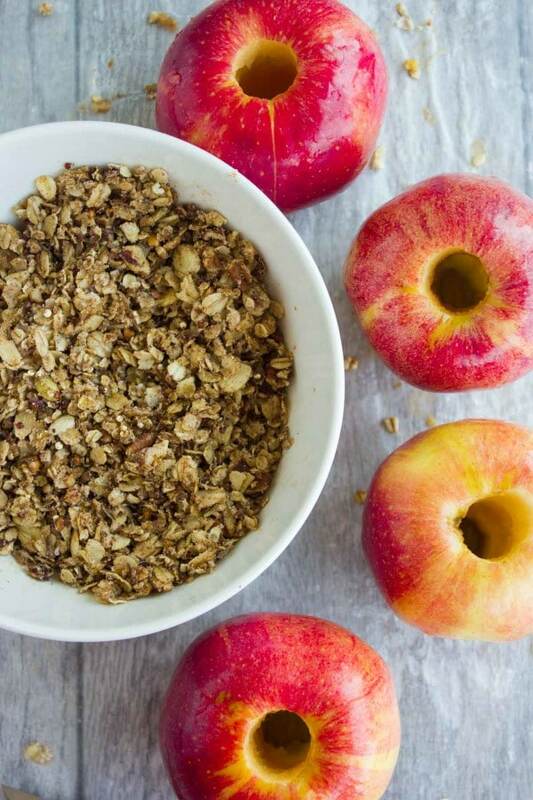 This recipe for baked apples with granola crunch is every apple lovers’ dream! 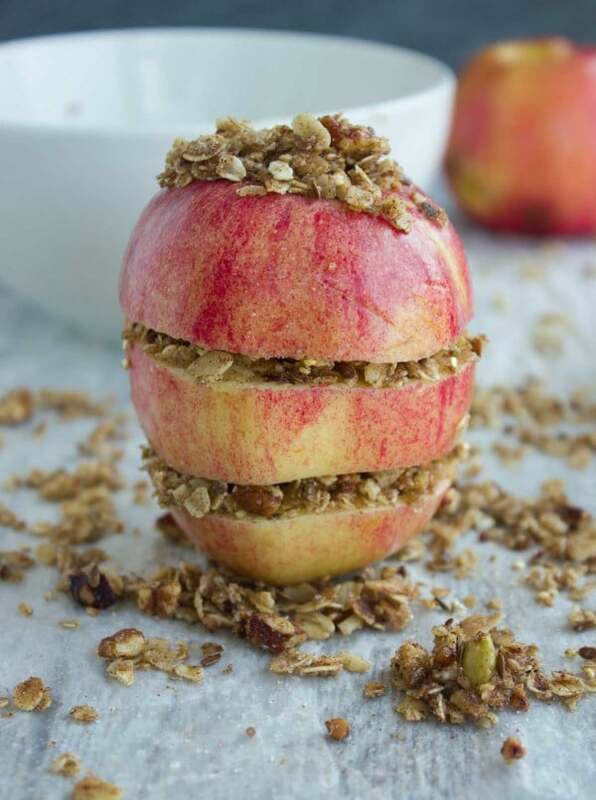 It’s all apple with a crunch of oats and nuts, and a touch of cinnamon all in one big healthy guilt-free bite! These baked apples are like a cross between apple pie and apple crumble, only made healthy and gluten-free! Oh and that smell of apples and cinnamon baking—real comfort mood! There’s something about baked apples that we all love. Is it because it reminds us of apple pie, or is it the cinnamon and spice, or just the good old apple..? Then there’s the oats, the nuts, that crunch, which pairs beautifully with the tender soft baked apples. Finally, there’s that feel good moment where you had a comforting dessert and your sweet tooth is completely satisfied but at the same time, it’s a healthy good for you dessert! It all starts with mixing oats, nuts and flax seeds, quinoa seeds along with cinnamon and a touch of oil and brown sugar in a bowl. By all means use any nut, seeds you have, or skip them all together and make it strictly oats, or use your favorite store bought granola!— It’s a very forgiving recipe so take advantage of that! Then we move on to coring the apples and slicing each apple horizontally into 3 discs. And start piling up the oat mixture in between the discs while stacking the apple back in shape. 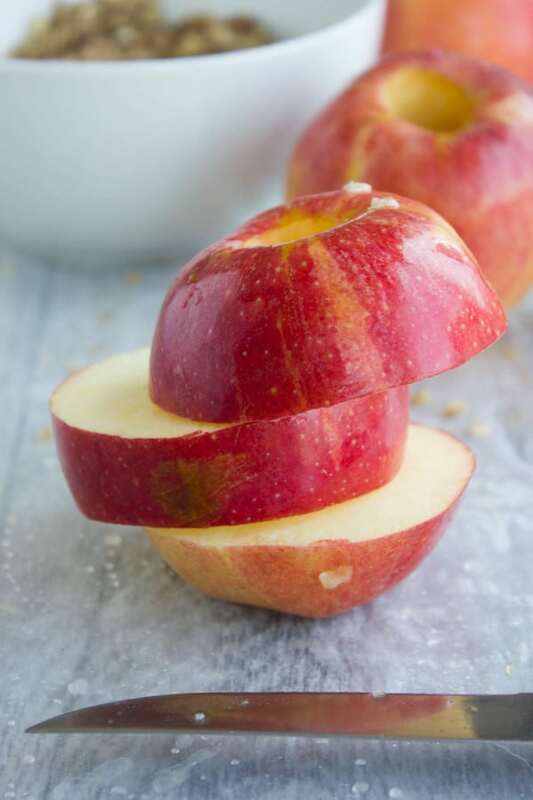 These stacked apples then hit the oven for 20-30 minutes (depending on how soft you like your apples and on the sizes of your apples) and you’ve got yourself a super easy, quick, healthy, gluten-free, vegan, paleo..(you name it!) perfectly comforting baked apple treat! Alternatively, you can bake the apple discs separately with each disc and it’s crunch topping in a single layer for a shorter time and then stack them up when done. This way you get a crunch on every apple piece, while when apples are baked whole, you get the crunch at the top while the inside layers feel like an oatmeal. 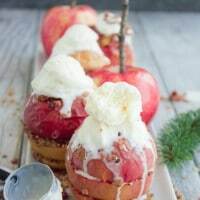 These baked apples are completely gluten-free (I use gluten-free oats) and the perfect dessert for a gluten-free diet. It’s also vegan and great for vegan diet, paleo diet and just good for anyone else! This is such an easy and light treat that I love to use as a sweet finish at my cooking classes when we’ve been making pizza all evening! Or when we’ve been cooking healthy options all evening and still need a sweet ending! Feel free to use any type of apples you prefer or have on hand—they all work just as fine. I personally love Gala apples in most of my apple desserts so that’s what I used here. Pears are a great substitute or variation on this baked apples recipe. Depending on the ripeness, they might not need as much time as the apples. These baked apples are best eaten right away, although the oat mixture may be well done ahead of time. Once baked, the apples can stay in your fridge for about 5 days. You can enjoy them cold or reheat them in the oven before serving. 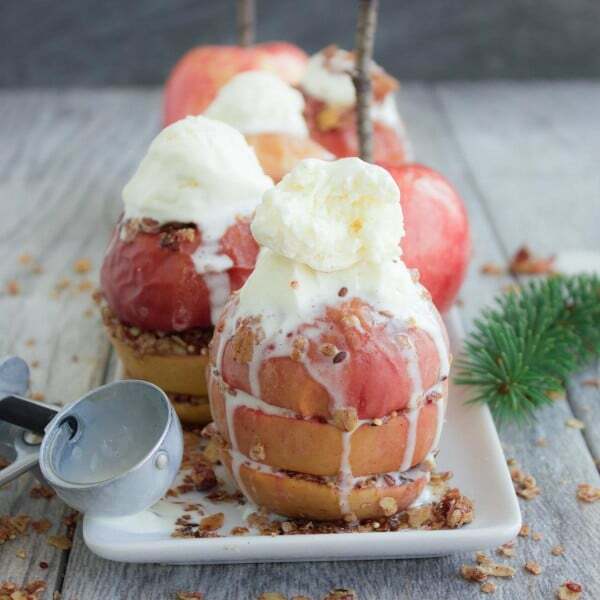 For a decadent twist on this healthy holiday dessert, brush a bit of melted butter on them before baking and serve the baked apples with a nice tiny little scoop of vanilla ice cream while they’re still warm. It’s the holidays after all! Optional spice mix: 1/4 teaspoon of ground ginger pinch of ground cardamom, pinch of ground nutmeg and ground cloves. Wash and pat dry the apples. Using an apple corer, core the inside of the apples (removing all seeds and stems). Slice each apple horizontally into 3 pieces; set aside. Prepare the stuffing by mixing the oats, salt, oil, cinnamon, brown sugar, flax seeds, quinoa seeds and nuts. Take each apple piece and lay it on a parchment-lined baking sheet and top each slice with about 1½ teaspoons of stuffing (depending on the size of your apples). For the top part of the apple, lay it skin side up and stuff it lightly in the middle. Repeat with the remaining apples. Bake for 15-20 minutes until apples are tender and stuffing is crisp. Enjoy with some ice cream or on their own! 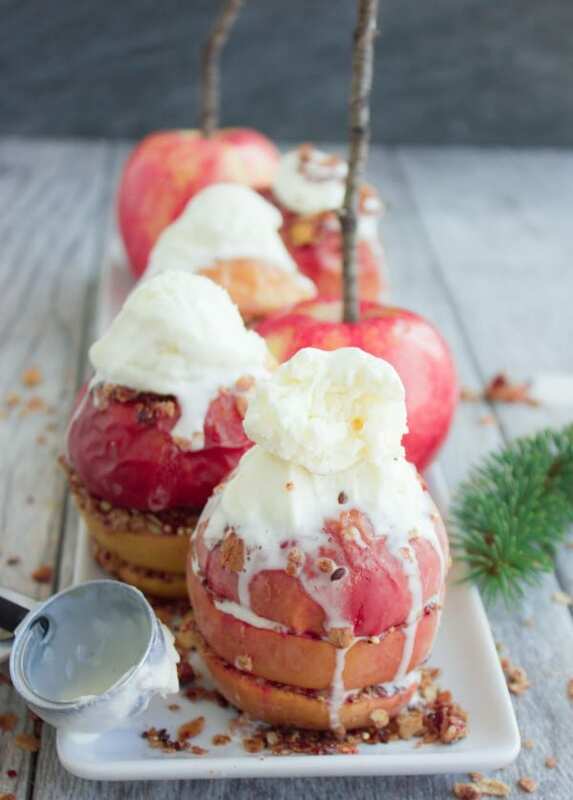 For a decadent twist on this healthy holiday dessert, brush a bit of melted butter on them before baking and serve the baked apples with a nice tiny little scoop of vanilla ice cream while they’re still warm. It's the holidays after all! A real whole apple – wow, who would of thought. I like apple crumble so look forward to trying this one day. Looks and sounds delicious!!! Oh my this is so pretty and sounds delicious. I like how it is the entire apple and the filling looks delicious! Perfect fall treat! 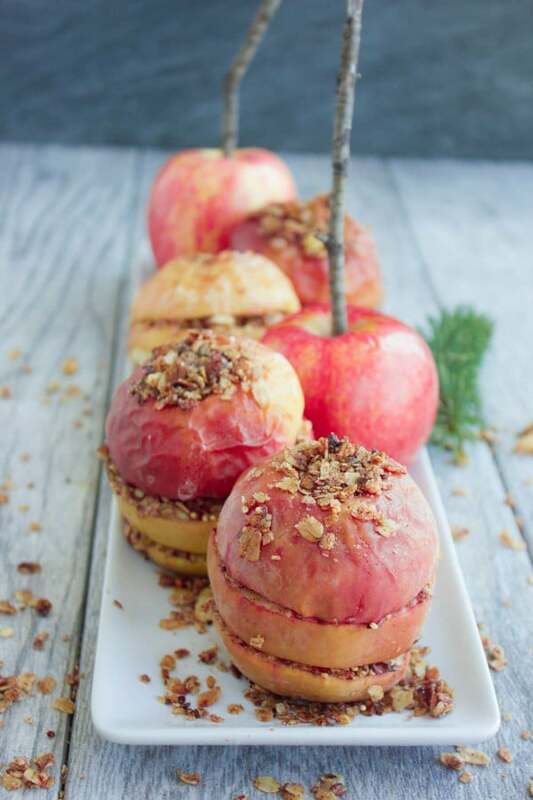 Wow, these Baked Apples with Granola Crunch are so cute! I would love to eat them for breakfast, lunch and dinner! Thank you for sharing this great recipe! Thanks Claudia, hope you make them! What a lovely presentation. I think these would make a great breakfast on Christmas morning! The baked apples look amazing and I love the crunch you’ve made for the center. The granola is a lot like the breakfast granola we make. Your ingredients of flax and quinoa seeds adds more nutrition to the crunchy granola. So yummy!! 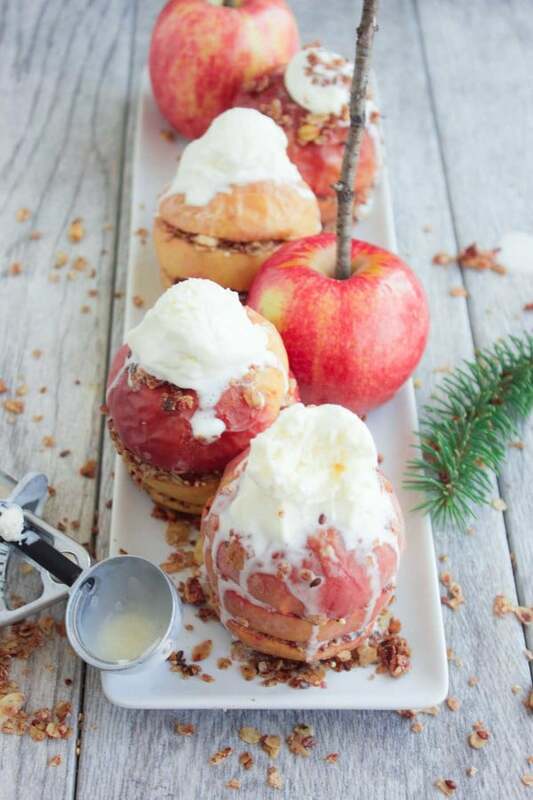 You had me at baked apples. 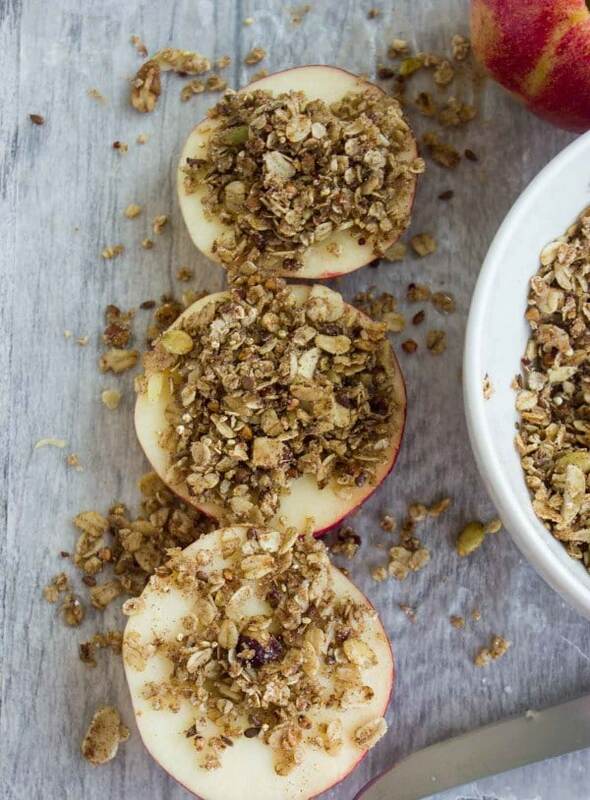 I love baked apples and then that granola crunch sounds like just the perfect thing to have with it. Yum. Such an easy and beautiful dessert!! I love how you keep them stacked too rather than doing them in halves, would be perfect for a family meal! Oh, how clever! That granola looks fabulous too! My son is addicted to apples especially the red ones. He’s only 5 years old but he actually went through an entire bag of apples in 3 days! He would love this recipe. I can’t wait to make it for him. It sounds delicious!